The deadline for comment on the NOS consensus statement is Monday 8th October 2018. 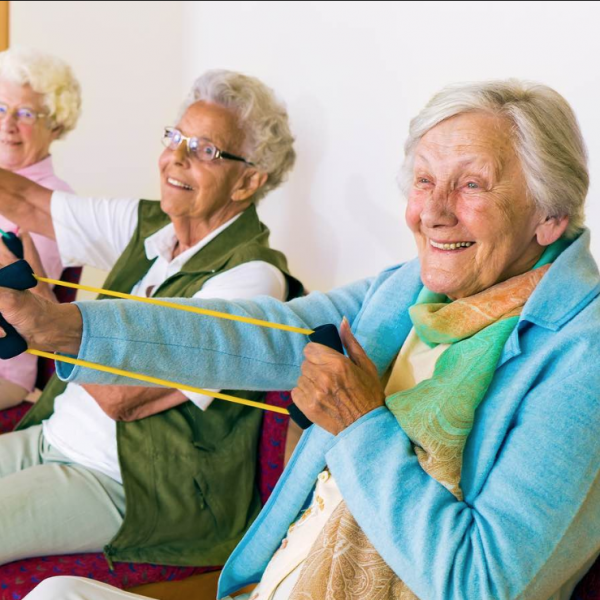 In 2017, Exercise and Sports Science Australia (ESSA) published their position statement on exercise presciption for the prevention and management of osteoporosis. This has hopefully signaled a shift in the accepted frequency, intensity, type and duration of exercise needed to prevent a reduction in bone mineral density (BMD). Furthermore the statement cohorts patients into fracture risk which is fantastic addition. After all not everyone can be treated the same and have equal response. Australia’s reputation for being world leaders in creating exercise programmes for diseases is well-known and respected. Prior to this statement, a ‘one size fits all’ approach to exercise for increasing BMD was adopted, regardless of age, clinical risk factors or exercise capability. The exercise favoured lower limb strengthening with the focus mainly being on improving balance to reduce fracture risk. This is ‘old hat’ and largely ignores that exercise can improve bone density itself. 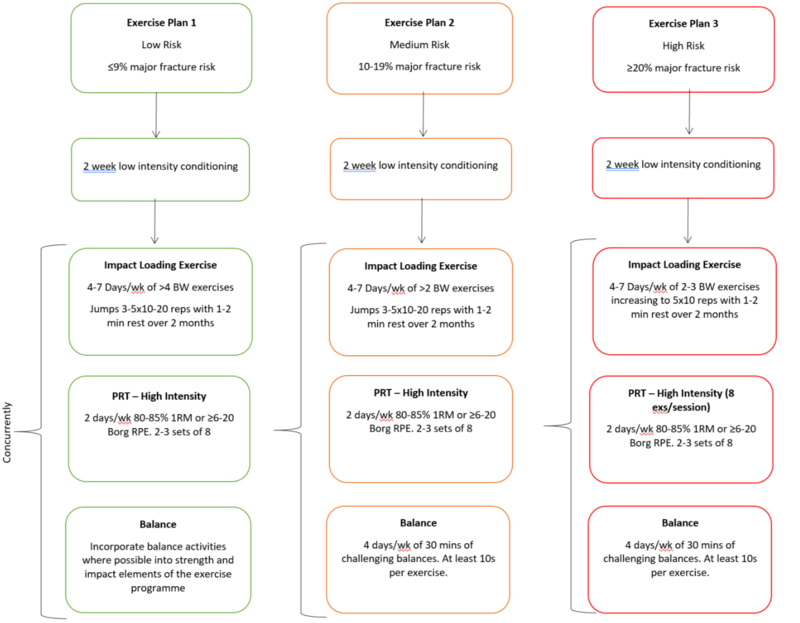 Beck et al (authors of the ESSA statement) argue this by stating that through a multi-faceted individualised exercise plan tailored to individuals’ fracture risk, bone density and balance a more significant improve can be achieved in BMD and falls risk. They propose that exercises should incorporate body-weight training, multi-directional loading and balance components instead of lower limb strengthening alone. It is worth considering that previous exercise models estimate that exercise is about as effective as calcium and vitamin D supplementation for increasing BMD. This was without using an individualised multi-faceted approach but without future research we won’t know if this new approach inceases BMD further. Unfortunately the consensus statement is behind a paywall but the exercise programmes have been interpreted and displayed for you below. As you can see there is a worthwhile addition of a 2 week pre-training phase which is often forgotten about in similar exercise plans. By including this you make sure your patients can make the most of the evidence based exercise elements, as it boosts their confidence in both you and themselves, as well as primes their bodies for a training response. During exercise and in everyday life there are movement patterns people with low bone density should avoid. These are discussed within the document and extreme flexion and twisting movements are to be avoided especially a combination of the two. In summary these guidelines offer a safe and effective programme aimed at increasing BMD with the consideration of individual needs, risk factors and falls. 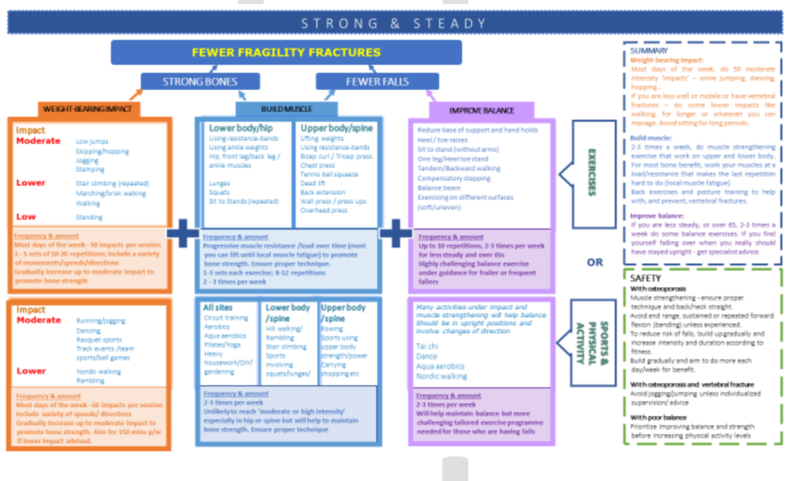 On the 10th of September the National Osteoporosis Society (NOS) in the UK released the draft of their expert consensus statement on exercise for osteoporosis entitled ‘Strong, Steady & Straight: an expert consensus statement on physical activity and exercise for osteoporosis’. It is available for public consultation and is ready for comments and responses. At the same time the charity is developing their new resources for the public aimed at helping them understand how to exercise safely and effectively. The driver for this development is because their current guidance needs revisiting. By NOS saying that “Exercise and healthcare professionals currently have no clear exercise guidance for people with osteoporosis” is untrue. We know that ESSA statement exists, offers clear guidance and is pretty good. Either way it is a positive that another organisation is revisiting their direction of travel when it comes to exercise advice. These are fairly self-explanatory areas of exercise and are comparable to the three core components of the ESSA guidance which are in fact referenced to throughout the document. Clearly there are similarities between the two statements which is a good thing. It means we are consistent in our approach to exercise for those with low BMD. We are moving towards a more individualised approach to helping these individuals ensuring we make exercise plans which they will get the most out of. Please take time to read the draft consensus statement and make comments with how to improve our current thinking of exercise in osteoporosis. Once the draft has been finalized and published Physiospot will produce a deeper interpretation for you. Consultation Draft: Strong, Steady & Straight: An expert consensus statement on physical activity and exercise for osteoporosis. National Osteoporosis Society 2017.